Family campsite open all year round. 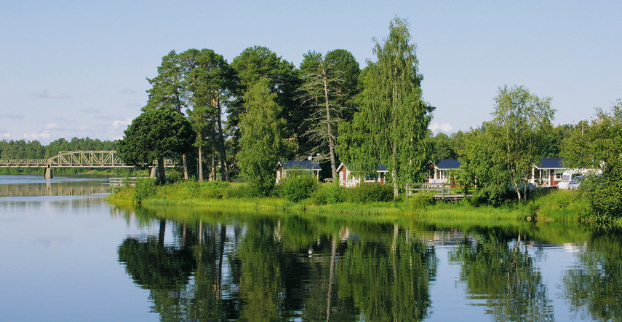 Centrally situated in Sveg on the banks of Ljusnan river. Close to hunting, fishing, outdoor activities and unspoiled nature. You can go swimming in the new indoor pool in Sveg – just 300 m from the campsite! It has a 25-m pool with 5 lanes, diving tower, water slide, climbing wall, whirlpool, children’s play area and a café. Shop cheaply at Sveg’s new department store – Dollarstore. In Ljusnan you can fish for big salmon trout and also try spinning in the heart of Sveg. In Sveg you will be welcomed by the world’s biggest wooden bear! If you are lucky, you may even spot a live bear! The bear is Härjedalen’s provincial animal and they are plentiful in the forests! In the winter, you can slalom ski at Björnberget with fantastic views – only 5 km from our campsite. There are 5 descents, a fun park and a children’s slope. 68 caravan pitches with electricity. Tent pitches.